Babies born via cesarean section are more likely to be asthmatic in comparison to babies delivered naturally, according to an article released on December 2, 2008 in Thorax, one of the BMJ Specialist journals. In the past decades, asthma rates have increased dramatically, paralleling an increase in cesarean section births. The proportion of these procedures has increased from 5% in the 1970s to more than 30% in 2000. However, studies examining the potential link between asthma and cesarean delivery have been inconclusive. About 3,000 children were followed until the age of 8 years with regard to respiratory health, and this data was compared to the methods of birth. 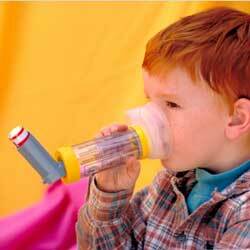 At age 8, 12.4% (362) had been diagnosed with asthma and thus prescribed inhaled steroids. While only 8.5% (247) of the children were born by cesarean, but these children were nearly 80% more likely to have a diagnosis of asthma, in comparison to the children delivered naturally. This association between cesarean section and asthma was strengthened by the presence of two allergic parents, indicating a hereditary predisposition to asthma. In children with two allergic parents, cesarean-born children were 200% times more likely to be asthmatic, in comparison with children without allergic parents, who were 36% more likely. The authors suggest that this association may be linked to the development of the immune system at birth. That is, a cesarean may prevent the baby from being exposed to certain microbes earlier in life. They also suggest that their findings are quite robust given the sample size, long period of follow up, and the strict definition of asthma. They say: "The increased rate of caesarean section is partly due to maternal demand without medical reason." The authors continue: "In this situation the mother should be informed of the risk of asthma for her child, especially when the parents have a history of allergy or asthma." The complete study was published on Thorax online.